Every home needs to be insulated in order to make it as energy efficient as possible. 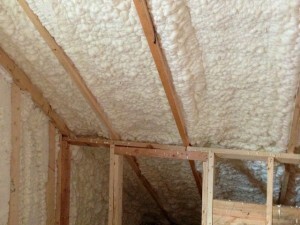 Many people are moving from the traditional fiberglass insulation to industrial spray foam insulation. Many new studies show that spray foam will help seal your home exceptionally well. It may be an investment, but it can save you money on utility bills, protect your home from moisture, mold and mildew. There are very many benefits of having this type of insulation. If you know what these are, the investment that it will take will definitely appear to be worth it. The first benefit of industrial spray foam insulation seems to be quite obvious for most people as it is the reason that most people choose to get it. It can save you money, so much so that the investment will pay for itself in the money that you will save on your energy and utility bills. Homes can lose a lot of air by being poorly insulated. By having your home properly insulated, you will keep your air in your house, saving you money on your heating and cooling costs. Another reason to put industrial spray foam insulation is your home would be to reduce moisture, mold and mildew in your home. These things can be very harmful to you and your family’s health. Mold spores can get into your home from outside through small cracks. By closing these cracks with insulation, less of these things will be able to get in and reproduce in your home. Also, the insulation will block out moisture, which is needed for mold to reproduce. Call us for any and all insulating needs that you have and we will provide you with the very best solution for your insulating needs. Our trained professional experts have years of training and in the field experience that will guide them in the proper installation of your homes insulation. Call us today and see what we can do from you! If you’re looking for a professional Jefferson Spray Foam Contractor, then give us a call today at 678-561-FOAM (678-561-3626) or complete our request estimate form.